What if “Dear Abby” were a saint? The popular satire and parody website, The Ironic Catholic, takes all the foolish questions we stumbling Christians have offers them to the great Catholic saints, who provide tough-love wisdom, insight, and considerable humor. I find it hard to find easy-reading Catholic books. Save for the local ones from Bo Sanchez and Shepherd’s Voice, I feel like there seems to be a lack of books written for Roman Catholics. Sure, there are a lot of Christian books out there, and yes Catholics are also Christians (please, no religious debates here, okay? ), but it’s hard to find books that actually talk about saints, the Roman Catholic church and all that. Or maybe I just don’t know where to look. Anyway, I was going through my Google Reader one day when I saw that I haven’t been reading the ones under my “Faith” tag. So I browsed the feeds and saw magic words, “free ebook” from The Ironic Catholic. I immediately clicked the link and got ready to purchase the book but it turned out the coupon had already expired. I felt a tiny bit disappointed, but then decided to get the ebook anyway since it was only $1.99. I read this book in between Emma, and it was the kind of book that I needed to clear my classic-muddled brain. Dear Communion of Saints is a collection of blog entries from a feature that The Ironic Catholic had in her blog. 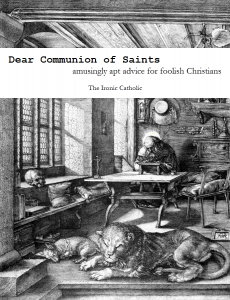 It’s a parody of an advice column of sorts for foolish questions that Christians may ask, answered in a saint’s point of view. Of course the author doesn’t mean that the saints would actually say the answers written in the book, but they are based on basic Christian teachings and are pretty obvious answers. Some questions really border on foolishness, too, like if they could play “Bad Romance” during a wedding mass, or why teeth are so poorly made, or how to cook a Thanksgiving turkey. There are some questions that somehow make sense, like who to blame regarding lack of mass attendance or if hell is dry heat, or if it’s okay to engage in celebratory hubris. It’s a fun, short book that makes you laugh and think at the same time, while still teaching the readers a bit about Catholic faith and the saints who are “answering” the questions. And it’s not just saints, too, but also some personalities in the Bible such as Job (whose book I just finished reading in the Bible — and it was beautiful) and even some of the archangels, too. I am poking fun at foolish human imperfections, many (if not all) of which are my own. Dear Communion of Saints is a good book for Catholics and non-Catholics (if only by entertainment value) alike. It was a fun and quick read, but I wished there was more. While I pine and wish for a second volume, I will spend some of my free time perusing the author’s blog. You should, too. Ouch! I also haven’t been reading the sites under “for His glory” (my tag) in my Google Reader too. But I do like reading Ironic Catholic. It’s a breath of fresh air from all the “serious” stuff we mostly have available. Although lately, I have developed a preference of reading the more serious stuff by the likes of St. Augustine and G. K. Chesterton. Hehe. I haven’t read any of St. Augustine’s or GK Chesterton’s works! o_O Any suggestions on what to start reading from them, especially GK Chesterton?